In essence, marketing. Create campaigns that speak to men in stereotypical masculine fashion so that said sausage-y men seeking sleekness can retain their sense of manhood. Mr. Wooster understands gender 101. Rationality, control, reason and intellect are associated with masculinity. RIPT FUSION is a classic men’s undershirt injected with steroids. Immediately, he will look and feel better in all of his clothes with a heightened sense of confidence. Along with the brand name, their tag line “get Ript” and the super-hero guy on the home page say it all. Spanx advertises: Man Spanx (play on words, perhaps?) 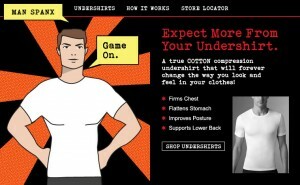 and the Spanx’d out dude boldly proclaims “Game On.” In other words, Spanx ain’t for wimps. Equmen plays up the whole “_____ and get laid” advertising approach (wear this/drink this/eat this/whatever and get laid).